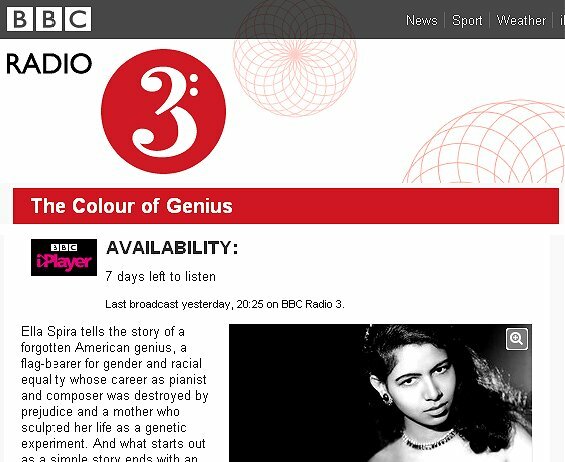 * Listen to Colour of Genius via the BBC i Player here until October 21st. Confirmation of availability of the iPlayer stream outside the UK would be appreciated. Quote is from Libby Purves' book Radio: A True Love Story. Any copyrighted material on these pages is included as "fair use", for the purpose of study, review or critical analysis only, and will be removed at the request of copyright owner(s). Report broken links, missing images and errors to - overgrownpath at hotmail dot co dot uk Also on Facebook and Twitter. The broadcast is available in Canada although you have to listen to 11 minutes of the Ulster Orchestra playing Gershwin's "Rhapsody in Blue". Many thanks for that. Bill Zick of AfriClassical has also confirmed he has listened to the BBC iPlayer stream from the States so there do not seem to be any blocks on access; I think it is BBC television players that are usually blocked on iPlayer outside the UK. Pity about the orchestral intro, but the fact that it is the original Paul Whiteman version with Joanna MacGregor at the piano is some compensation. Checking in from the Philippines, the program (including the ten-minute "Rhapsody in Blue") streamed fine. Still listening to the "I got rhythm" variations, so I don't think there's any problem with iPlayer streaming to this part of the world. Listening from México pretty well. I listened to the BBC program on Philippa Schuyler, and found it very interesting. I read the entry on her father in Wikipedia. I had forgotten her father's conservative political position. So was surprised by that mention on Phillipa. When one considers the source, her conservatism is understandable. Her mother was described as a "liberal." Not so, if she was connected with the John Birch Society. This does not detract from Philippa's genius. Her tragic life is testimony to the insanity of our world at personal and public interface. I was getting into my car at the grocery and saw a child, eight or nine, who resembled Phillipa Schuyler. Her father exited the car and took her hand. The father was black, with dreadlocks. Both seemed happy. Today, there are tens of thousands of "genetic" Philippa Schuylers, being hugged and allowed to grow. The theory of Dr. Watson, not to hug children, was cruel.